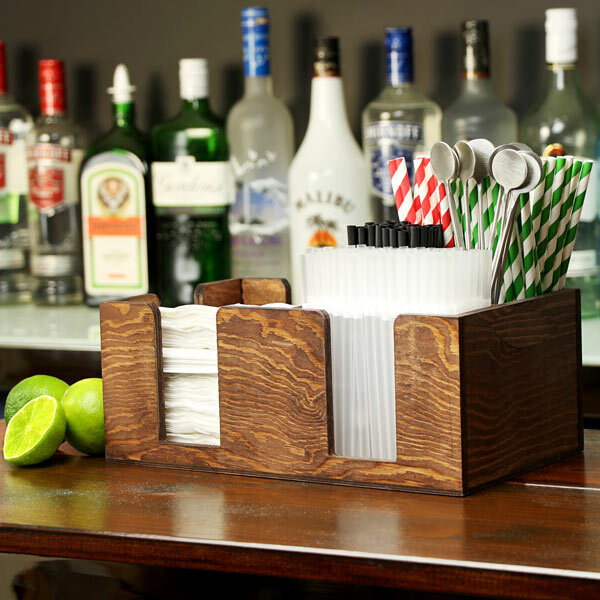 The Wooden Bar Caddy offers bar organisation with a more natural appearance. Made from real wood, this walnut stained plywood bar top organiser provides the perfect home for straws, cocktail napkins and other bar paraphernalia. With neat separated compartments, you can keep your bar top tidy and present a professional appearance. "Much nicer than plastic bar caddy, goes well on my home bar. It's made of pine plywood and stained a dark brown. Was a bit rough so had to give mine a bit of a sand down. Has plenty of space for stirrers and straws, and EASILY fits the 25cm napkins." "Goes perfectly on my wooden bar top! Sturdy construction and looks abit nicer than the plastic versions"